I really love flower arrangements that are monochromatic. For today’s post, I made a flower arrangement with artificial “real touch” ivory roses and buds. Before my wedding, I wanted to create my own centerpieces using artificial flowers. I had a lot of free time and I was starting far in advance. I felt that getting flowers from florists would cost too much for something that would wilt in a few days, and would have a lot of filler flowers. In the end, my friends talked me out of it, stating that artificial flowers don’t look very nice. Although I did end up loving my fresh flower arrangements at my wedding, I still kind of wish I did it. I think this arrangement shows that artificial flowers can look nice and not too fake. Whether you decide to use artificial flowers or fresh, this type of arrangement with only one kind of flower can still be lovely. Those flowers are gorgeous! Thanks for stopping in at Show Off Friday. It was great having you join us! I have seen flowers made out of paper from books before, that is a lovely look. I’ve seen those too and they’re so pretty! White roses are the loveliest of all the colors. I’ll definitely have them in my wedding. I love white roses too! Love these gorgeous Ivory roses! These real touch artificial flowers are perfect for giving a personal touch to the wedding centerpieces. Thanks a lot for sharing this inspirational post! Those artificial flowers are stunning! They almost had me fooled. Your arrangement turned out great! Wow, these flowers are just extremely impressive. 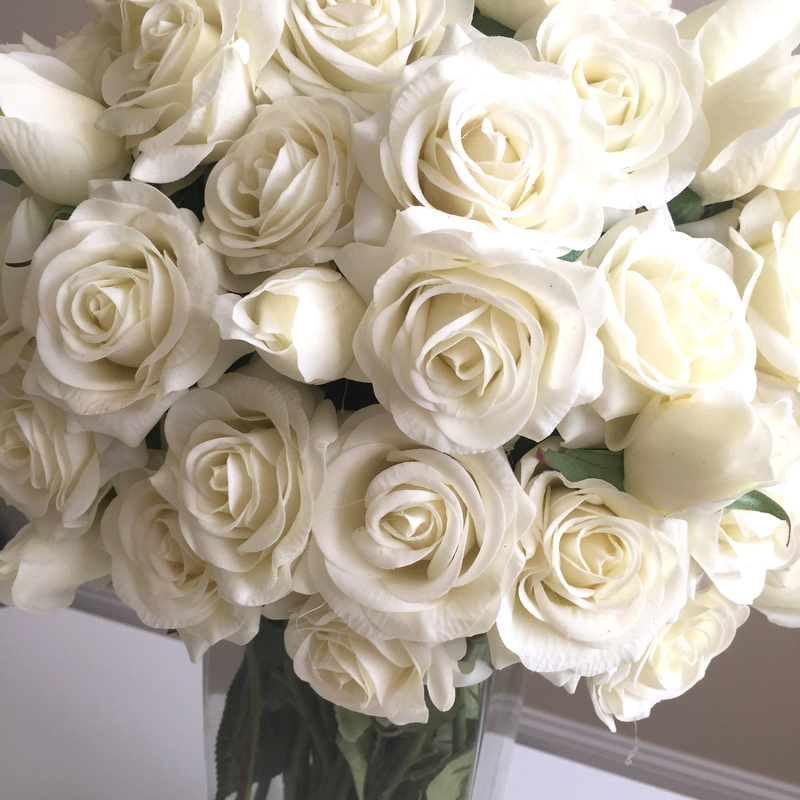 White roses are always beautiful. The lovely white roses are really dear to me. I had a bouquet of white roses on my wedding day! I can still remember how beautiful they are. Great artificial white flowers here! Look real.